Danny Goldberg's In Search of The Lost Chord: 1967 and The Hippie Idea resonates with today's activist readers. How plastic is the hippie? That's a question to dig in on. Some media will show you black and white photos adorned with flowers and smiles and peace signs while espousing the legendary, progressive steps taken by these individuals. Others will just tell you about The Altamont Speedway Free Festival, where drugs led to death and the party turned as sour as the beer on the Hell's Angels' breath that night. The truth lies somewhere in the air in between, under, and above all that, but Danny Goldberg, a wide-eyed teenager at the time of these events, looks back and attempts to add some perspective to these biased perceptions. 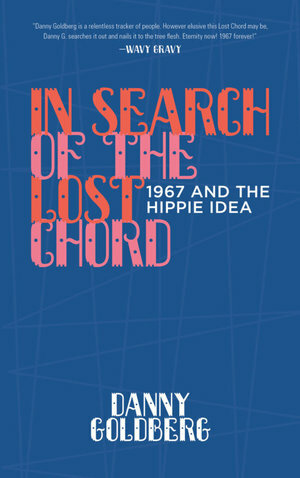 By the end of In Search of The Lost Chord: 1967 and The Hippie Idea (reissue, Akashic Books), the reader will understand one thing clearly: that 'chord' he speaks of is still ringing. It's just that some are not listening, anymore -- and some never were. The 'hippie' is labeled as the central study here, but for the reader, the focus is a little less clear. Goldberg bounces from the beatniks to the Black Panthers to Allen Ginsburg like an overzealous college sophomore on a late night coffee binge. If a reader came towards the book looking for a study on Hippies and the Haight-Ashbury district via fashion and drugs, they will not get their fill, as these items are discussed, but only to the extent as they are important to the larger meaning of the term, 'hippie'. For Goldberg, a hippie is something larger, something to be looked at with a planet-wide lens. As he says in the introduction, "It was the original 'open source", and, "...the era can only be understood through a collection of disparate, sometimes contradictory narratives." Speaking of timelines, there's barely one present here. Although the year 1967 is literally in the subtitle, Goldberg is loose with time, bouncing around as he sees fit to explain a topic. As an explanatory device, it makes complete sense, yet it can be a little flustering. Goldberg will describe a person's death in one paragraph, jump to their accomplishments in the '50s in the next, and then describe their policies in 1967 in a third. So, one could say that "all over the place" describes the movement of the book, and there would be no disagreement here. It's a weakness, if you're looking for one. The strengths in the writing, however, lie in it's comprehensiveness. After completing this book, the reader will know quite a lot about LSD, Vietnam, Tim Leary, Martin Luther King, Jr., Jefferson Airplane, and the Grateful Dead. Open the book to any page and it can be guaranteed that one of those topics will be on it, but why not? Ask any random person to list ten things they know about the era, and many of these will be present. So, a deep dig into each subject is worthy of the time of the reader. The history presented here is important and necessary, but the biggest flash comes with the "Epilogue" and the newly included "Afterword 2018". This is where that chord comes ringing back. "The Summer of Love" may have be a misnomer because of all the blood shed and bad trips, but the love was still present in there, somewhere. The hippie may have mostly been a media term, but these people did do their best to add a new note to the mix. Whether naïve or not, the hippie idea included love for all and a vision of a unified future. Goldberg uses the afterword to bounce these ideas off our current political landscape and it's quite revelatory. That same chord that was ringing in the ears of some of those hippies of 1967 is now ringing in the ears of those with their boots on the ground in their own respective resistance movements today. The hippies were just a part of a continuum, a continuum we're all still watching unfold, but as Goldberg says, "Patience is not unhip." We're all waiting, and we're all hippies, if that's the case. Peace.